Discussion in 'iPhone / iPad Apps' started by sk, Jul 17, 2014. 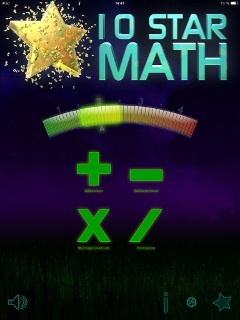 10 Star Math is a game mainly for kids to train mental arithmetic in a simple, straightforward and fun way. 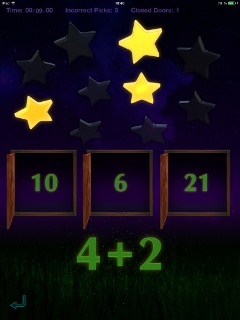 Figure out the numbers and make the ten stars to light up. Getting stars to shine is good, to do it fast is better. Each level can be adjusted in detail to exactly suit your kids experiences and knowledges the best. The smallest children find it fun to see the stars light up, no prior knowledge of math is required. Older children, with more experience, will find it challenging to respond in time and as accurate as possible. Even for adults the game can be quite the challenge with a level that has a more difficult setting. 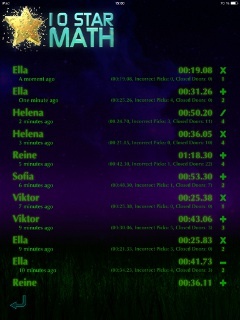 You can also adjust how the scores will be counted if you pick the wrong answer. Mental calculation with the four operations. List of the last played rounds. Supports Guided Access to hide the settings button. Mental arithmetic should be fun! You learn something new and improve the skills you already have.